HWGA - short for "Here we go again"! I have been very unhappy recently with both of my main hobbies. I am finding it hard to engage with my N Gauge model railway - See my Pennvale Sands Blog. Note that it hasn't been updated since 7th June! I have also been unhappy with my plastic model making as both of the recent models that I started have ended up either discarded or with broken parts. The Banff Strike Wing Mosquito that I was so keen on has been discarded because I can even make a mess of a Tamiya aircraft kit (it gets worse than that so hold on). One of the nose panels is completely out of place and I have started the painting so there is no fixing it. As I am very keen on the topic and I have some special decals, I will buy another kit and start again. As previously mentioned, my friend Mark bought me an Airfix 1:48 Sea Hurricane kit, which I have been building very carefully only to break the undercarriage. I still can't explain why I even fitted the parts before the model was painted and decalled, but there we are. Fortunately, Hornby (makers of Airfix) have a good spares operation so I have new parts on their way. Watch this space. Of course, this should not be. The trouble comes in three parts. I know that it is wrong! The answer is to finish the car and only show one side. However, 3. above still comes onto play! I am sure that I will finish it, someday, so I have put it back into its box and back on the shelf. This is three disasters in a row so I have to do some serious calming down before going on. I want to get back to the Banff Strike Wing so I have a Beaufighter and a Mk.IV. Mustang ready to go, along with the appropriate decals. I will need to purchase another Tamiya Mosquito to complete the set. In the meantime, I have gone back to basics. 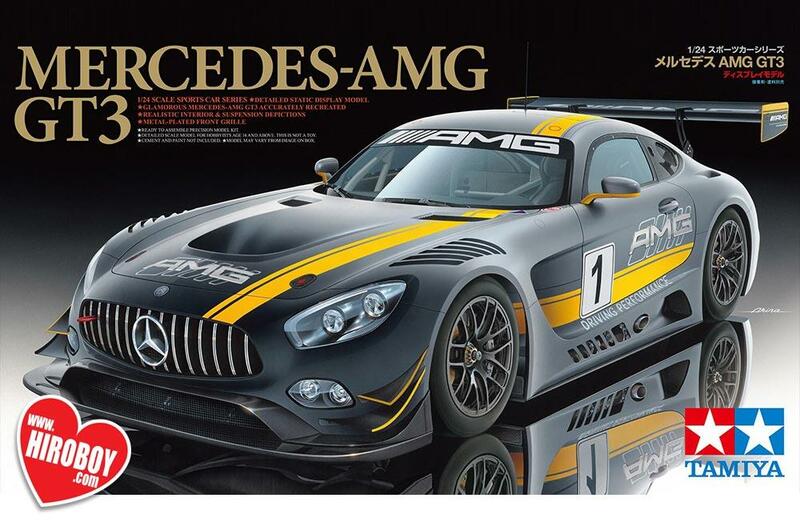 The latest Airfix 1:72 Mk. 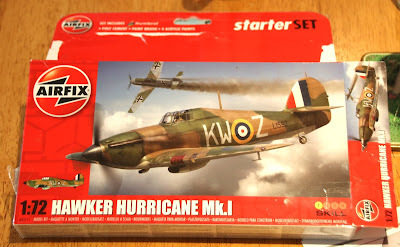 I Hawker Hurricane is one of their new mouldings and is a very neat little kit. I have the paints so I don't need anything else to make it. Plus, it shouldn't take more than a couple of days to do. That should give my confidence a small boost and enable me to get going again on my plan. My Vallejo Coastal Command box comes in useful for the paints. I have sprayed up the Sky parts along with the interior green. So far, so good. Revell Avro Shackleton AEW.2 (because I like the colour). As they used to say in the War - Gently Bentley. I will get there but it is hard. I can't forget that the Tamiya kit cost £50.00!!!!!!!!! All of a sudden, I am all fired up. Airbrushing holds no fears, using aerosol spray cans is becoming common place and I am keeping much better track of the progress. 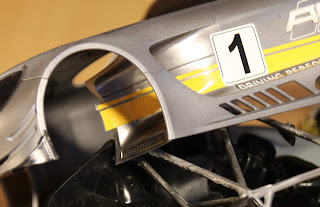 One thing that I have started to do is to use Tamiya Fine Surface Primer as my basic primer. I like the Vallejo black polyurethane primer but I have never got on with the white equivalent, even though I have tried relative makes such as AK Interactive and Mig. When making the Hawker Sea Hurricane, I used this spray can and it worked fine so I have carried on with it throughout the AMG build. It goes on quickly and easily, smells a bit but dries quickly. I am a big fan of Wheeler Dealers, a UK TV program where they rebuild old cars. The mechanic in that program, Edd China, sometimes uses an aerosol can and he using a special technique of quick sprays across the surface rather than trying to spray a large area in one press. Using this technique has saved me a lot of stress getting all of the parts coated with primer. That's it. Basically, you get enough to hang the wheels on and to show through the wheel arches. The suspension itself is quite well detailed - although I now see that I have to touch up some of the paintwork after the handling required when putting it all together. The black chassis looks a bit bad but, of course, so one will see this. The underneath is also painted black but has been sprayed with some Humbrol gloss varnish - out of an aerosol! All the paints are Pre-thinned for Airbrushing. The paints supplied are called "Basecoat Paints" which are a solvent based paint (similar to Cellulose but different) which dry with a matt finish and require clearcoating. As they are solvent based they need to be applied over a suitable primer, they can be Solid, Metallic, Mica, Pearl or Candy colours. They dry almost immediately so are very easy to use. I find that Liquid Reamer is just as good as a clean up as their specialist Airbrush Cleaner but I have a large can of the cleaner to hand so I use that. Mind you, the can is currently in storage following my move out of my hobby room so I may be forced to used the Liquid Reamer on occasion. Anyway, I went through the instructions and marked each part on the sprues that needed to be sprayed. I have found in the past that if I miss a part it is a right faff to get the airbrush out again just for that one bit. This time, I marked each item on its sprue with some red marker and now I have every part sprayed. All the other parts can either be hand painted or sprayed with normal acrylic paints, which are easier to use and clean up from. Now, I have every part sprayed and having given the body a good colour coat both inside and out, I can get back onto construction. It's been a long time - again - between builds. 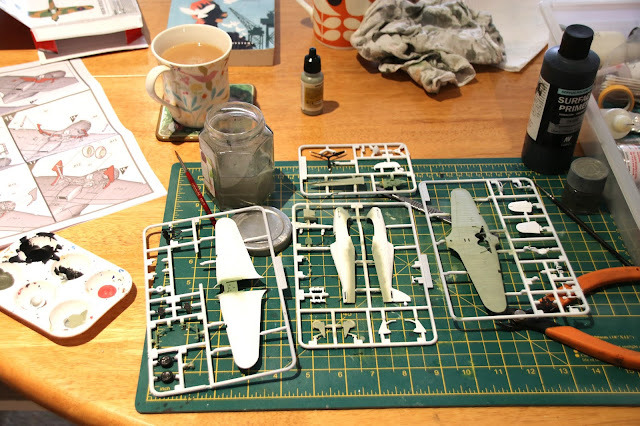 I have been working on a 1:48th scale Airfix Sea Hurricane that my friend Mark bought for me. 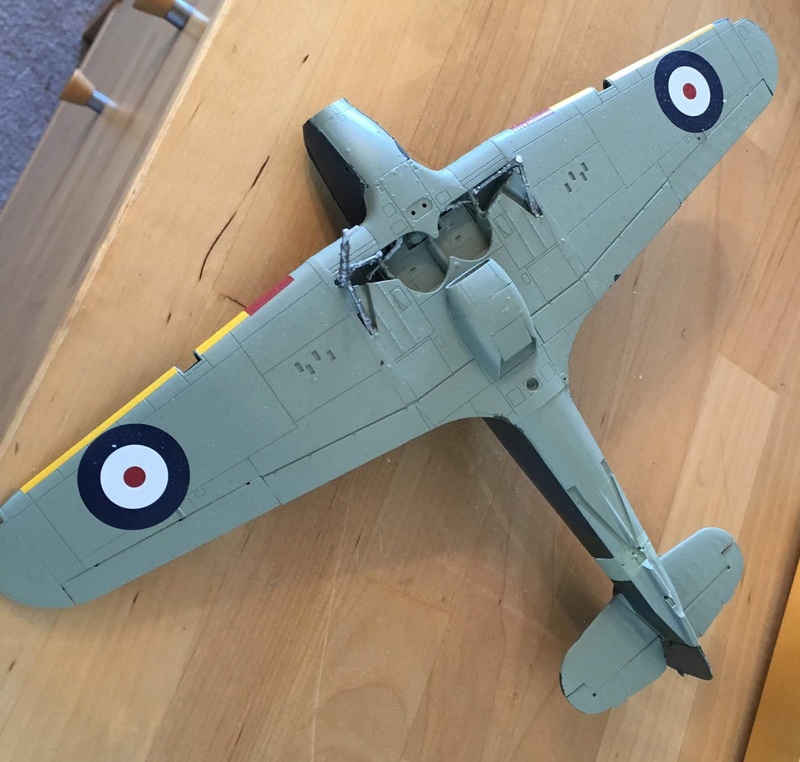 He purchased it at the Ipswich Club show because I had bought a pack of WWII Coastal Command paints to go towards my proposed theme of the Banff Strike Wing. As you can see, it is coming along quite nicely but... (isn't there always a but with me?). I never, ever, ever, attach anything that may break until I have finished decalling so why did I fit the undercarriage legs? As you can see, the port (left) leg has broken off. Fortunately, Airfix can supply a replacement part for £2.00! Hence, it is now on hold until I get that. Incidentally, I used Tamiya sky for the band around the rear fuselage and found that it didn't match the colour of the underneath. It seems that the Vallejo sky is quite a bit darker than the Tamiya but it is too late now as I have started decalling. In between, I have decided that I must get on with some modelling rather than just sitting and staring at a computer! I have the fantastic Tamiya 1:24th scale Mercedes AMG GT3 along with a bottle of Zero paints body colour so, under pressure from my wife to "get on with something!" I have opened up the box and started work. The Pennington curse hit at that point. I got out my airbrush to spray the base colours (having given everything a coat of Tamiya surface primer) to find that my bottle of X-18 Semi Gloss Black was empty and my usual trusty large bottle of Vallejo Black primer was totally absent! Valerie is going out so I now have to wait until she comes back to pop up to Hobbycraft for some spares!